Put me on the next plane to Denver, Salt Lake City or Reno. Please! I have the powder flu--that itching, burning feeling where you yearn to blow off work, make a beeline for the roads taking you straight into the mountains, click into those ski bindings, and hit the slopes for what sounds like knee-deep powder. But there's no remedy for this ailment when you're living in the flatlands of Illinois and the Midwest's temperatures have skyrocketed to near record-setting levels--even a trip to Wisconsin on the ski bus is out of the question, at least for this ski snob. By Thursday morning, Northstar-at-Tahoe reported 32 inches. On the south side of the lake, Heavenly counted 21 inches. Back to the north side and Squaw Valley USA was also sporting about a three-foot snowfall. I had been taught last winter that a good Lake Tahoe storm meant at least a foot, but I still can't fathom skiing, or seeing, nearly three feet of snow falling in a 24-hour period. And for a place that had been quiet about reporting snowfalls, which tends to mean they're not coming at the levels snow-seekers are used to, this was needed. If you don't want to be tempted by the "greatest snow on Earth," don't follow the Ski Utah Yeti. This friendly snow creature only makes the powder flu worse from far away when he tells you it's monster dumping in the mountains or warns of an impending snowfall. 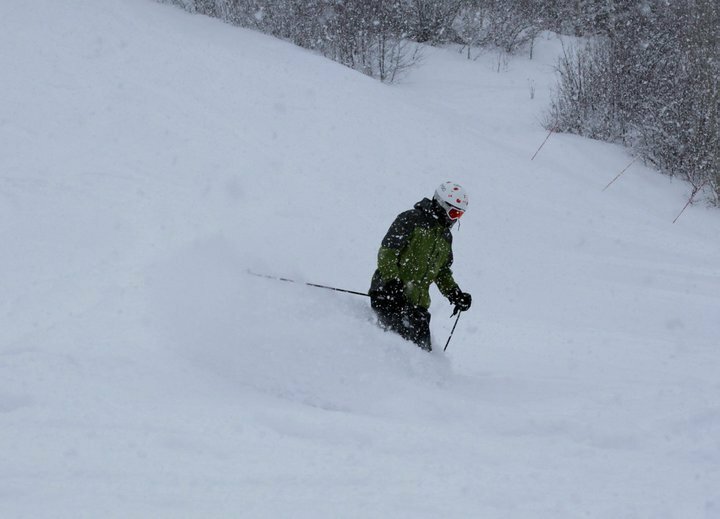 This time around resrots from Alta to Brighton to The Canyons sported at least 8 inches of snow with more on the way. Every time there's a snowfall this season, Colorado resorts post pictures, especially Snow.com (here and here). For this girl, who would trade digs in a second with anyone living in this state, those pictures make it even tougher to be stuck in Chicago. I may be heading out west to ski next week but Beaver Creek, Breckenridge, Keystone and Vail are already calling my name. Their storms are only starting but how in the world does it snow three inches an hour at Beaver Creek? If I-70 is open Friday morning, I'm willing to put money on the numbers ditching work for a three-day--or four-day if Monday is already scheduled off--weekend. Jealous yet? I am. I wish I had a Presidents' Day Weekend out of town--it'd be a good one with all the snow and even better to practice those powder skills. Instead, I'll be waxing and sharpening my skis and doing my snow dance for next weekend. Photo of Beaver Creek's three inches an hour grabbed from Snow.com's Facebook page. It's a Girl for Deena Kastor! Boot Camp Day 2: Are We Done Yet?